The boss resigned under pressure and other Veterans Affairs managers are likely on the way out. Now the challenge is to solve the problem by providing timely health care for hundreds - perhaps thousands - of waiting veterans around the country. Even Eric Shinseki knew he had to go, President Barack Obama said Friday in announcing the resignation of his only Veterans Affairs secretary over a growing scandal involving sometimes deadly waits for care at VA hospitals. Obama went before reporters shortly after meeting with Shinseki at the White House and said the retired Army general told him that "the VA needs new leadership" to address the widespread problems chronicled in new reports this week, adding that Shinseki "does not want to be a distraction" to fixing the situation. 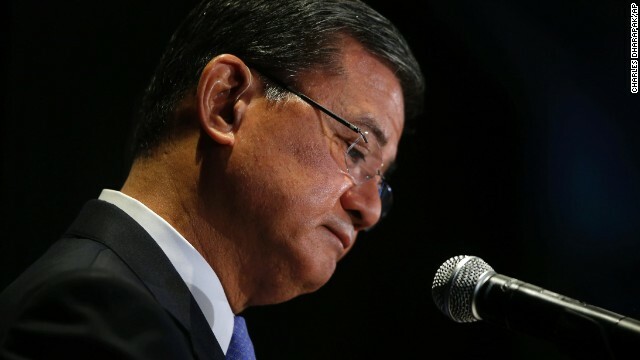 We want you to weigh in: Will Shinseki’s resignation improve conditions at VA hospitals? Vets are dead because of bonus money and corruption!!!!!!!!!!!!!!!!!!!!!!!!! 3000 Federal cops work at the VA and did nothing to stop this!!!!!!!! Even the VAOIG turned their backs and let this happen. All of these toads who never served in the military are the first to rush in with their opinion, just to take another shot at the current administration. Disgusting. Problem does not lie at the Top With Mr. Shinseki it lies in the culture of the government employees. I have come to see and believe that public service has come to take a dive in our integrity, Honor of public service, pride in our work ethic, and have simply come to look the other way when our leaders, whether at the bottom, middle, or top have ask of our employees to dishonor themselves and/or their integrity. Mr. Shinseki is responsible for the VA and all that it is and does, however, the bureaucracy has literally tie his hands to do so. The fact that Congress had to intervene to create laws that could get folks fired speaks to this point. Mr. Shinseki, like many other Directors of government departments is just one of many scapegoats to pay the price and yet, those who dishonored our public servants once again go without punishment. Without punishment you will not change the decay of the culture that our public service has suffered in this post 9/11 world of, keeping your job instead of doing your job! The problem is the government itself. You're poor. How's that SS and Medicare treating you? No it isn't, it is mismanaged. Plenty of funds no one running the store. VA has half a billion left in unspent funds for care. Its not money its management. Published December 16, 2013 (Sent from Shinseki to the President). It will give you a clear view just how oblivious Shinseki was to everything in the VA. He kept feeding the administration with a lot of non-sense, and the administration's unwillingness to confront him about it.